From time to time, La Baguette Magique will impart its love for a brand/ product into a review. Instead of getting caught into some lengthy introduction we'll start off right away with Nuxe, a French brand with an international following which has featured in a number of glossy women's magazines. In 2002 I crossed the Nuxe path again, this time at Pure Beauty, King Street, Manchester, an upmarket service-focused standalone beauty concept store (sadly with a brief lifespan and early demise) developed by Boots and rolled out to half a dozen carefully-selected prime city centre UK-wide locations including London's Covent Garden (which I visited in March 2002), to preserve the exclusivity of high-end beauty haven experience. Across its two floor levels, Pure Beauty combined staple fragrance heavyweights (Calvin Klein, Ralph Lauren, etc.) with the lesser-known skincare/ make-up specialists (E'spa, Stila, Nuxe, etc.). I remember that Nuxe's gold-infused Huile Prodigieuse was gathering much press coverage at the time and still does (a firm favourite with beauty blogs!). Across the decade, Nuxe remained in my subconscious although strangely I never finalised that first-ever purchase. This was about to change in March of this year when I went down to a French chemist (or shall I say pharmacy) looking for a day-cream as I'd run out of my regular American cosmeceutical. And this trip down the pharmacy sealed the deal indeed as it presented me with the opportunity to step out of my own beauty comfort zone routine, faced by new purchasing habits and a somewhat return to simplicity compounded by my shop-bare countryside lifestyle. Here was the brief: I needed a no-fuss moisturiser with no long list of unpronounceable chemistry-laden concoctions, no promises of revolutionary age-defying results, simply a product that would convincingly deliver moisture and kindness to my elements-exposed skin without breaking the bank, an undemanding cream I could slap on and go, without guilt or feelings of preciousness. Crème Fraîche (no, not the one that Jamie Oliver spoons onto his puds!) just does that: a little goes a long way but even if you apply a bit more, it gets absorbed in quick without that greasy shiny feel. The freshly-scented crème is light, melting and feels sumptuous on the skin. It is infused with botanicals aplenty (lupin, pea, green tea, acacia, almond, coconut, oat and non-GMO soy). My skin is left supple and well hydrated. After applying the crème, all I need to face the day is finish off with an SPF and I am then ready for the not-so-kind elements: sea breeze, strong 100+ mph winds, Summer heat, ambient winter humidity, etc. Since its creation in 1999, Crème Fraîche has become one of Nuxe's success stories, reaping beauty awards in its wake and - more importantly - making happy women in the bathroom. The + sides: Botanical content, texture, finish, feelgood factor, price, eye-candy for the bathroom shelf! 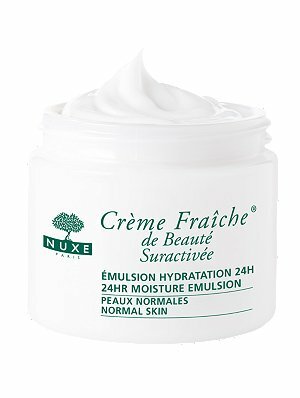 Crème Fraîche de Beauté, by Nuxe, is available for normal skin (Suractivée), dry skin (Concentrée Suractivée) and combination skin (Formule Light), in either a 60ml glass jar or 15ml tube format. In France I paid Euros 27.70 for the jar. (U.K. RRP: £28.00 and U.S. RRP: $43.00).